Home News Check This Out! Bishop Oyedepo, Bill Gates, Emir Sanusi, Announced among 2017 Most Reputable People on Earth! Check This Out! 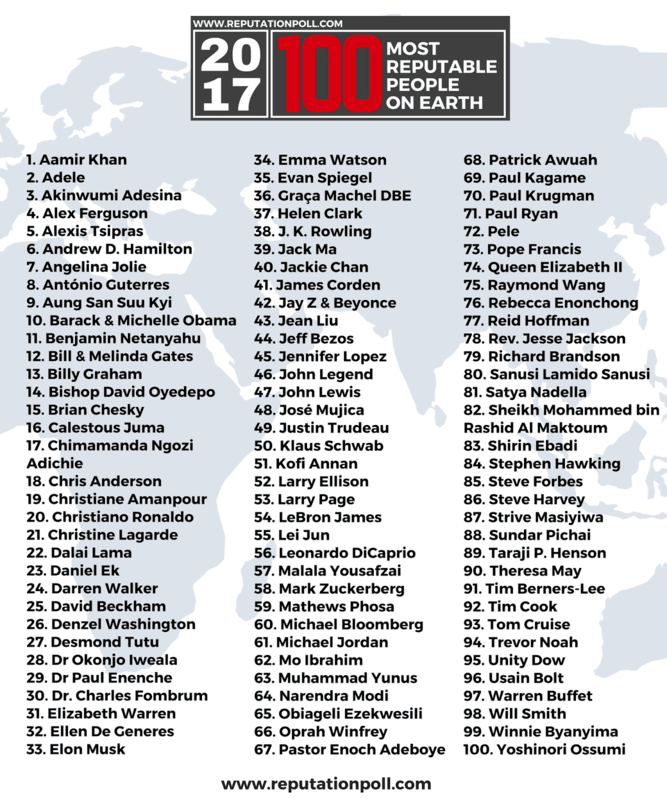 Bishop Oyedepo, Bill Gates, Emir Sanusi, Announced among 2017 Most Reputable People on Earth! 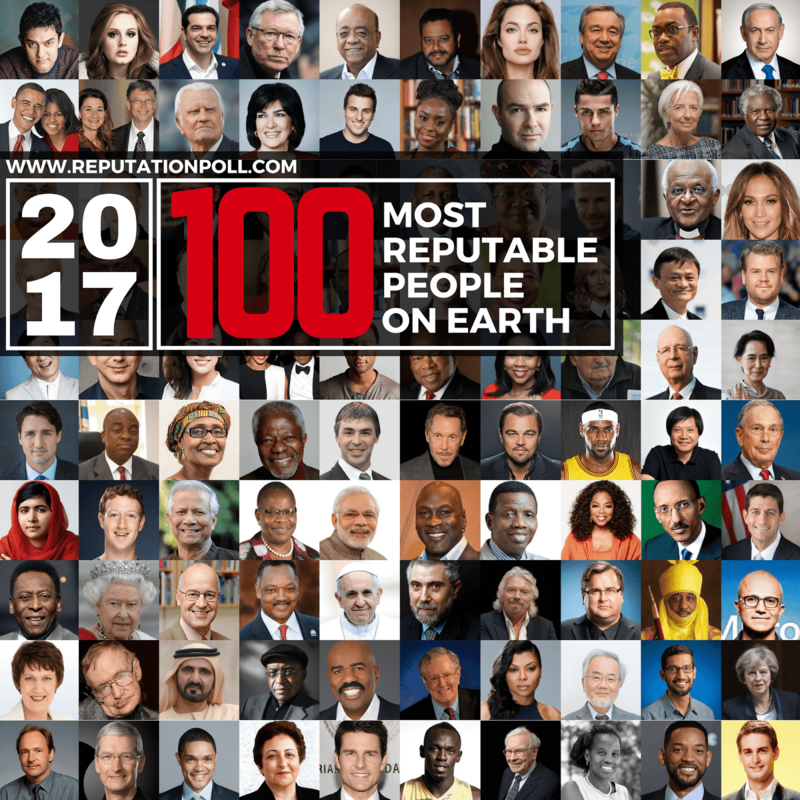 South African research-based, global performance-management consulting company, Reputation Poll has announced its inaugural list of 100 Most Reputable People on Earth. A list of individuals across the globe who have amassed high reputation for themselves through the works they have been engaged in. The list which features individuals from diverse sectors including politics, entertainment, policy, education, business etc., also has representation from 37 countries across the globe. 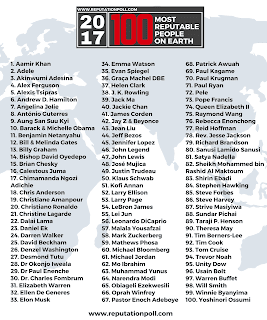 Notable individuals on the list include renowned Evangelist Billy Graham, 98, who doubles up as the oldest person and Raymond Wang, Malala Yousafzai, both 19 years, and the youngest people to be listed. Statically, the USA has the largest share of reputable personalities numbering 39 also with a representation of 25 females, 3 couples and 72 Males. The Management during announcement of this list, noted, they are looking forward to these individuals whose continued work impact lives across the world and encourages them to do more. This list was researched in partnership with the Institute of Leadership & Management and leading PR Firm, Avance Media.